The planet is warming and the effects of it are undeniable in certain places specially the sensitive Polar Regions. Scientists agree that due to rise in temperature polar ice caps, ice sheet covering of the sea and mountain glaciers are melting rapidly. The animals in Polar Regions specially the polar bear are adversely being affected by the global warming as they are losing their ice habitats rapidly. Polar bear live on the Arctic ice sheet over the sea most of the time than on the land. Their sea ice platforms are moving apart due to melting. Their population size is decreasing as hunting opportunities are decreasing and food scarcity is increasing due to declining sea population. 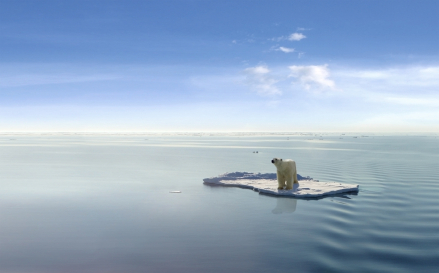 As climate change melts sea ice, the U.S. Geological Survey projects that two thirds of polar bears will disappear by 2050 (http://www.nwf.org). In 2008, the polar bear has been listed as a threatened species under the Endangered Species Act mainly because of the disappearing of its primary habitat that is the sea ice sheet. Due to temperature increase in the ocean, thermal expansion will take place and sea surface will rise. In addition, melting glacier and ice caps will continue to add more water to the ocean and cause the sea level to rise further. It is predicted that with a meter increase in sea level (3 ft) a considerable section of U.S. Eastern seaboard would submerge and with a further increase to 1.5 meter (5 ft), one sixth of Bangladesh could be lost permanently. Increase temperature of the ocean causes more evaporation and more rise in sea level. These along with the change of climate pattern will increase the probability of more frequent and deadlier natural disasters like cyclones, hurricanes and tsunamis. As the earth surface keeps getting warmer, proportion of dry foliage and land covers increases in the forest and wild areas; making them more vulnerable to frequent and destructive wildfires. With the increase temperature of the earth; more loss of vegetation, desertification and soil surface aggravation will result. Severe droughts are not only expected in Africa but also in Europe. Heat wave will be more intense and frequents globally. Increase temperature of earth surface and ocean will adversely affect its population by destroying biodiversity and links among food chains. Oceanic acidification due to climate change and warmer surface temperature will endanger the oceanic phytoplankton as well as the coral reefs. As coral reefs are very sensitive to temperature change and pollution; many of them have already been observed to be affected and damaged. Warmer temperature will increase droughts and loss of soil fertility and affect the food crop production everywhere. The fresh water supply will also diminish in countries where it is already scarce. The increase in natural disasters like flood, cyclone, tsunami etc. will have direct negative impact on the economy of the various nations. More resources will be required to produce foods, providing water supply need and maintaining public health.